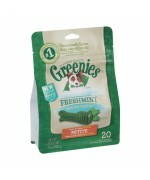 Greenies Dental Chews are naturally made with added vitamins, minerals, taurine, and chlorophyll (sodium copper chlorophyllin) to provide a complete oral care, and offer a nutritionally complete and balanced blend of highly soluble and digestible proteins for adult dogs based on AAFCO recommendations. 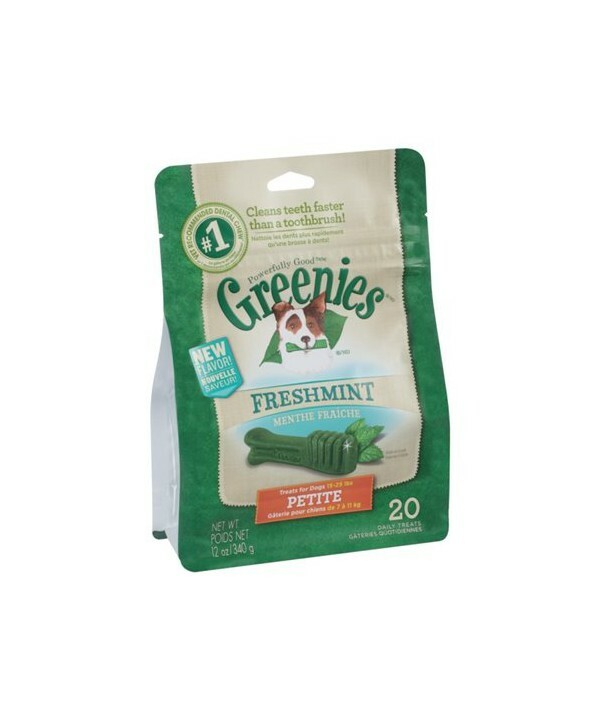 One Greenies Dental Chew a day helps clean your dog’s teeth by using his natural chewing action to wipe away plaque and tartar buildup from the surface of the teeth. The chewy and flexible texture allows teeth to sink in with every bite all the way to the gums for more effective cleaning. They are clinically proven to clean dogs’ teeth by fighting both plaque and tartar buildup, freshening breath, and maintaining healthier teeth and gums. Designed in a variety of sizes that offer the most appropriate texture and hardness for dogs with a variety of bite force capabilities — to better care for all dogs of all sizes.